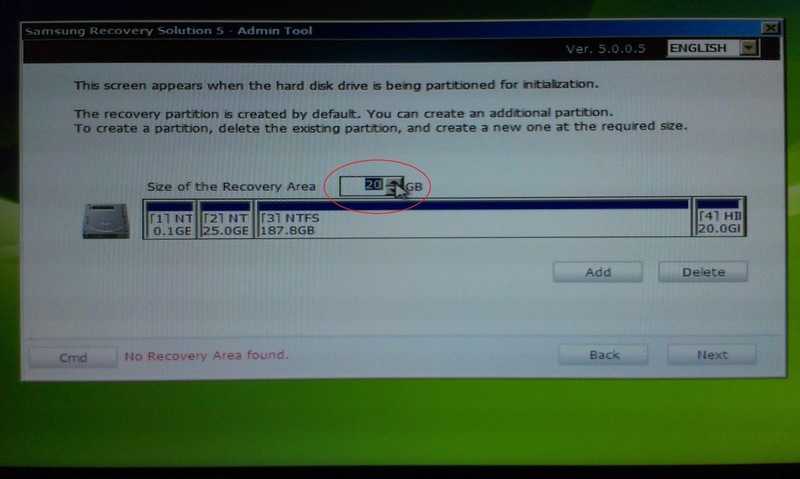 Here Im gonna show you how to create Samsung Recovery Partition with simple steps. 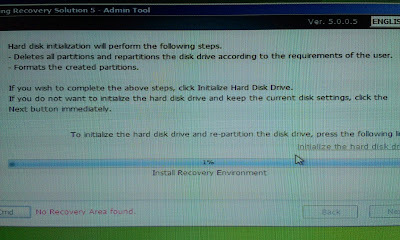 In Samsung laptops this partition is created already when you buy the laptop. 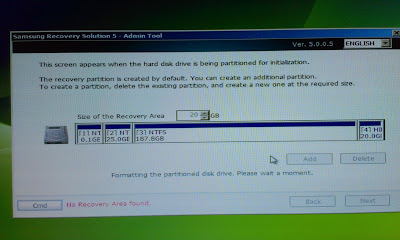 But sometimes people delete this unknowingly, while partitioning hard disk. 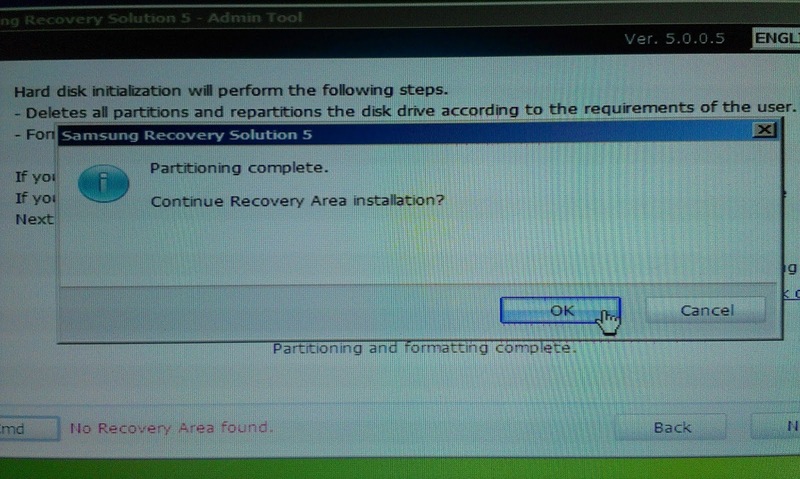 So if you have deleted then you can recreate the OEM partition yourself very easily. Note: Data from your Hard Disk will be deleted. So Create a back up of your important files. You need another Samsung Laptop which have already installed Samsung Recovery Solution 5(or 4) on it. 1. 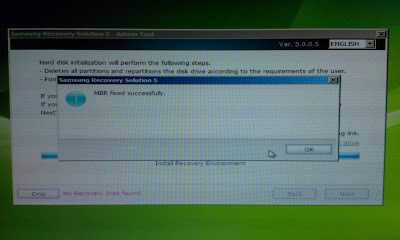 Now start the laptop and press F4 to go to Samsung Recovery Mode. 2. 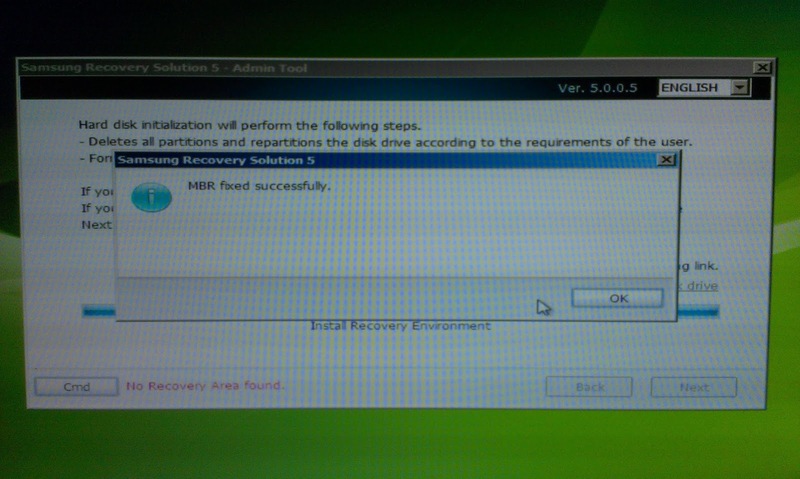 When Samsung Recovery Solution start click ctrl+alt+F10. 3. 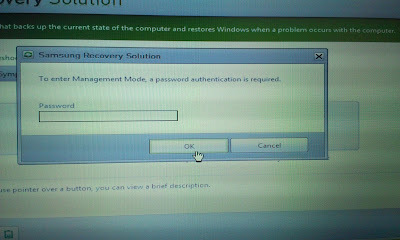 Now Samsung Recovery Solution ask you for password. Type secclx or secos as password. 4. Insert your USB pen drive. Now go to Tools. 5. 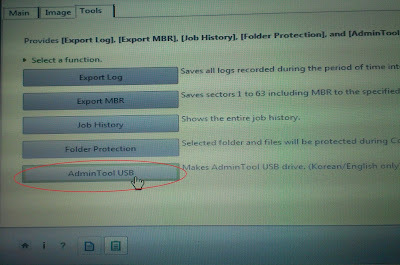 Now click on Admin Tool USB. And Click Yes. 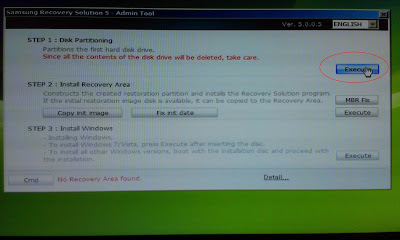 Within a few moment 'Samsung Recovery Solution Admin Tool' bootable Pen Drive will be created. You can download it as an iso image. And make a bootable USB with this image. 1. 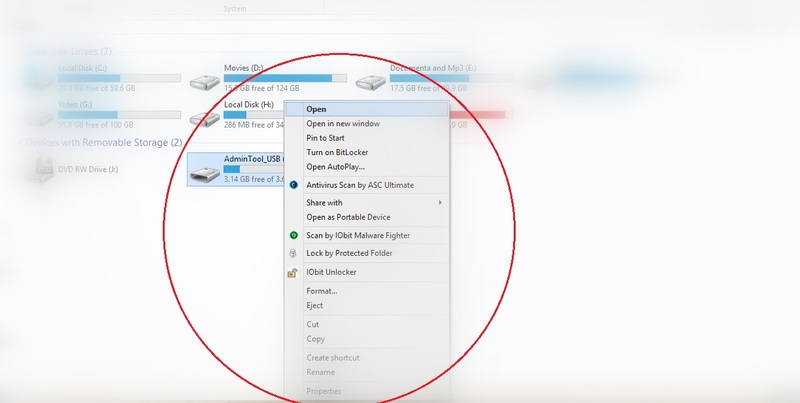 Make USB-HDD your first boot device. 2. 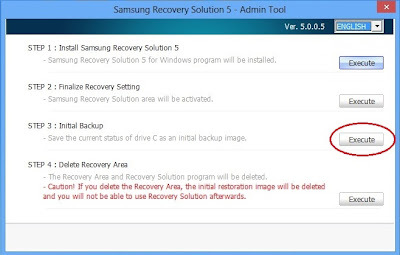 Insert the Samsung Recovery Solution Admin Tool USB pendrive in laptop. 4. 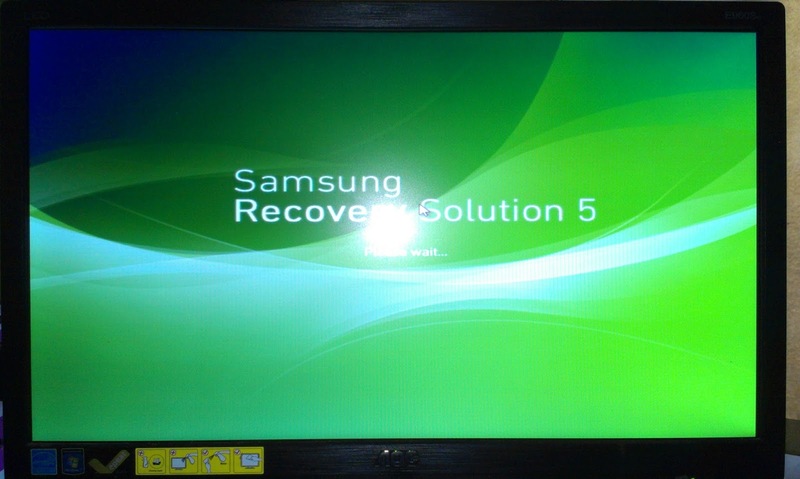 Now Samsung Recovery Solution will start. 6. 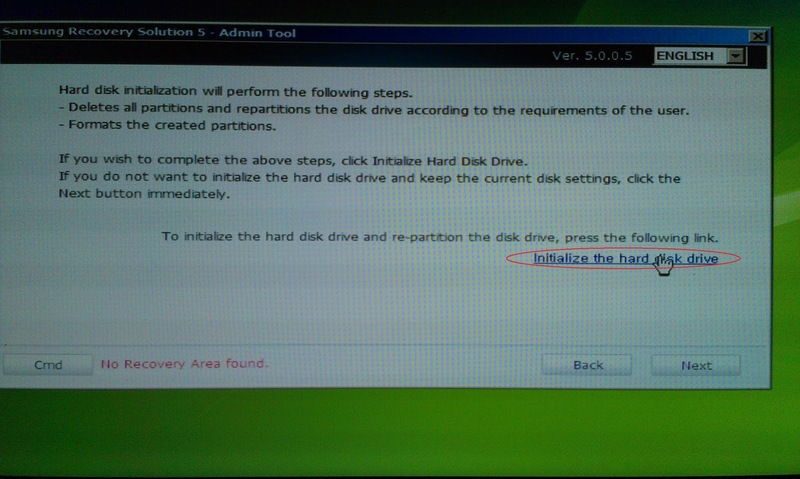 Click on Initialize The Hard Disk Drive. 7. You'll be asked for a confirmation. Click Yes. 8. 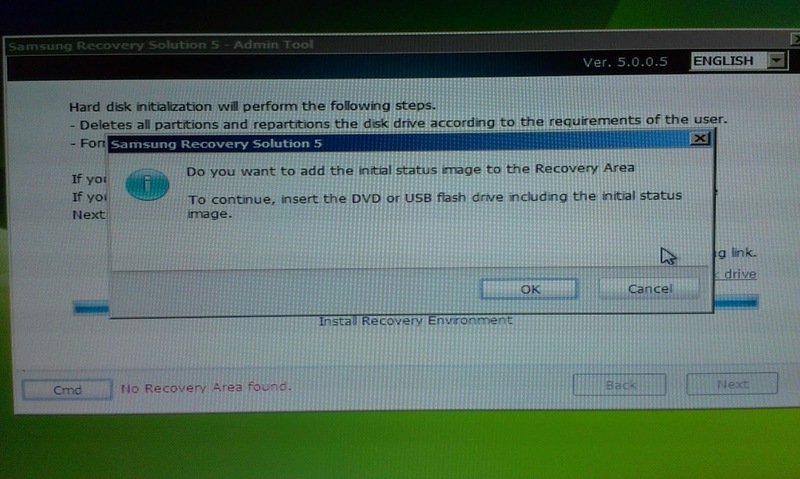 Now define the Size Of Recovery Area as 20 GB. And click Next. 9. 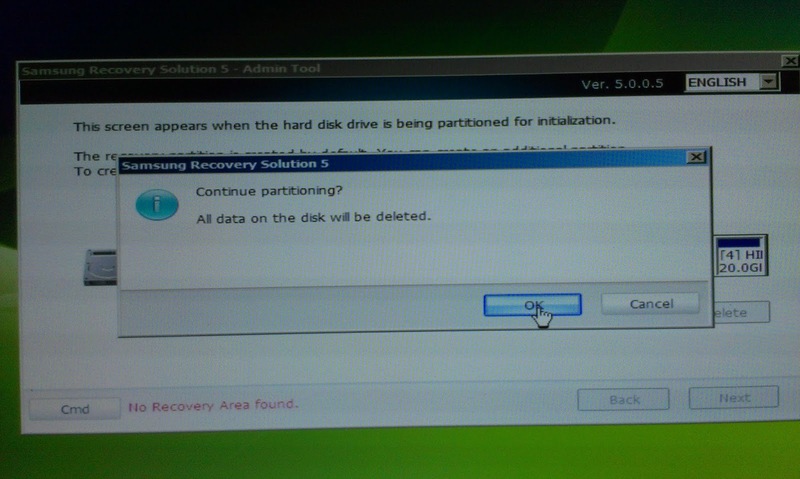 Now click OK. And continue partitioning. 10. Wait for some min. 11. Partitioning Complete. 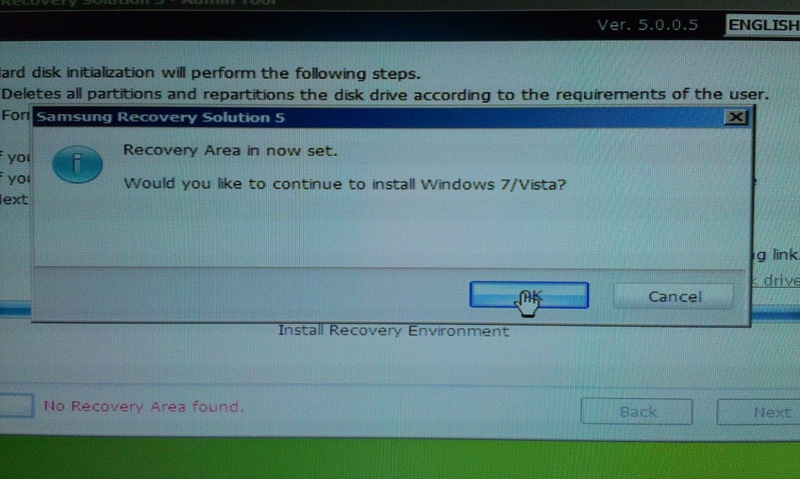 Continue Recovery Area Installation... Click Ok.
12. Now a new Window again ask for Continue Installation. Click Ok.
13. Wait for some moment. 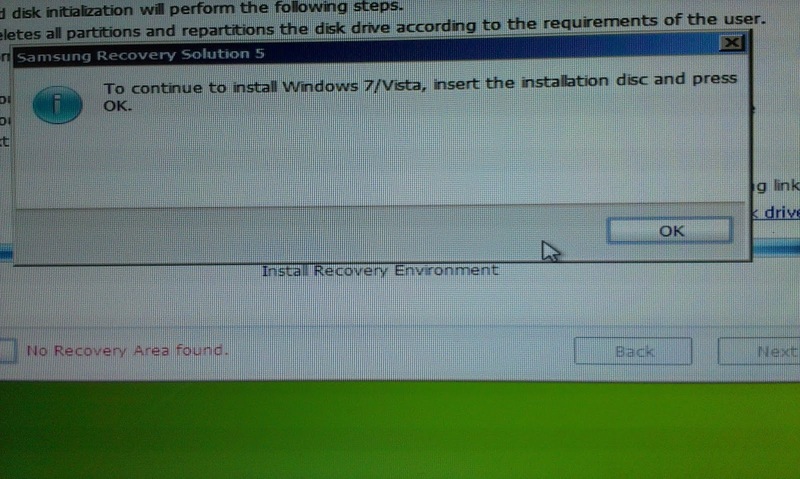 Recovery Environment will be installed. 14. 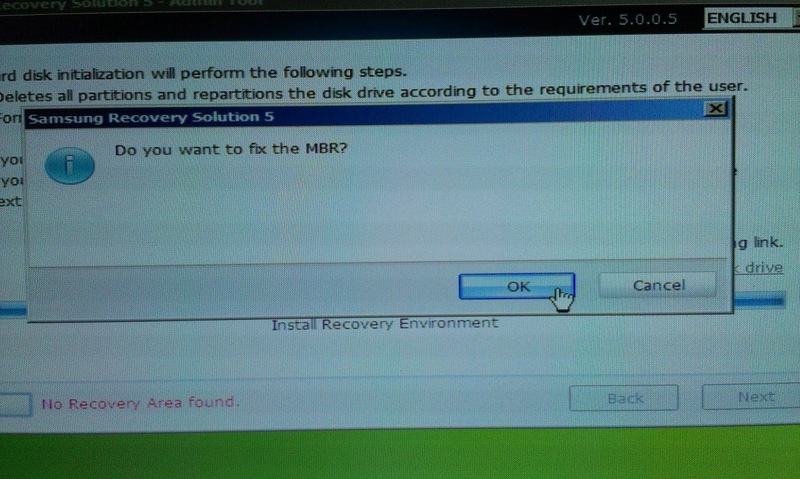 Now you will be asked if you want to fix the MBR. Click Ok..
15. 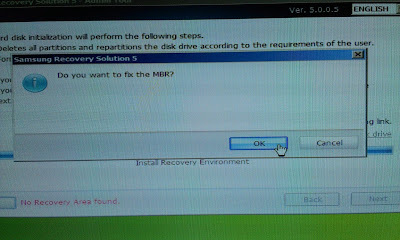 After MBR fix successfully completed Click Ok.
17. Recovery Area in now set. 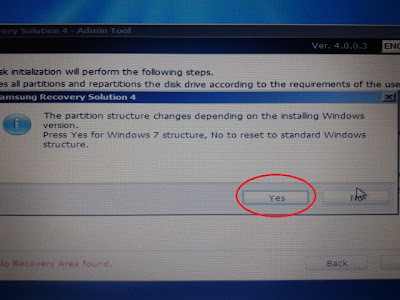 Now click Ok to continue Windows 7/8 installation. 19. Now format and install windows on your laptop. 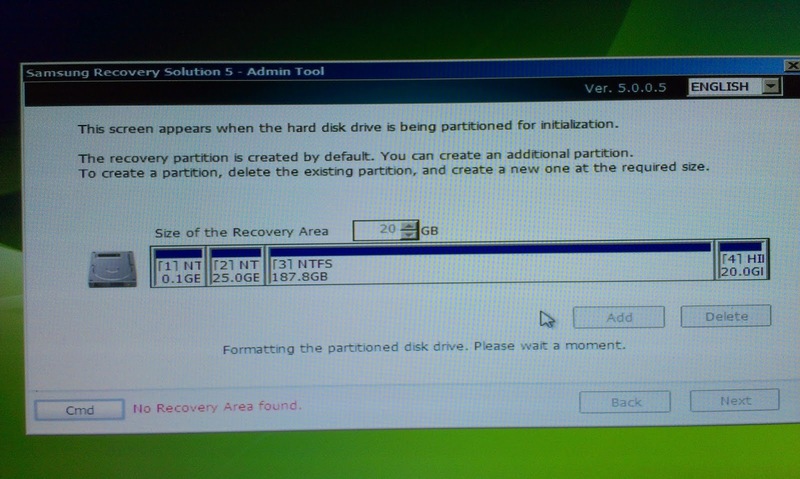 You can create partition while Windows Installation. 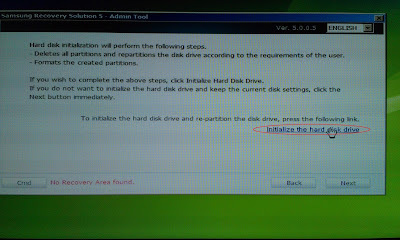 Or do it from Computer Management after Installation complete. 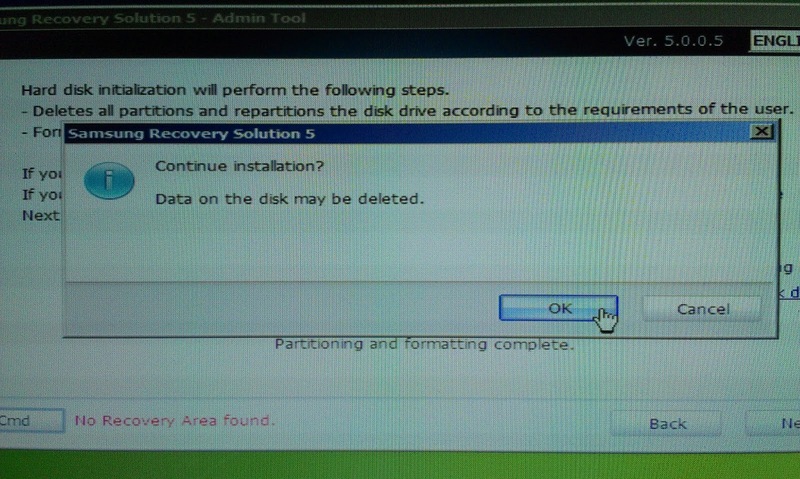 JUST DON'T DELETE THE OEM PARTITION, which you've just created. 20. When your computer will start for first time after completion of Windows installation run Admin Tool application from pen drive. 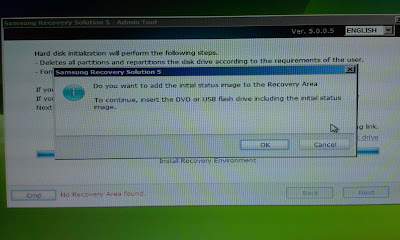 To do this open your pen drive(Samsung Recovery Solution Admin Tool bootable pen drive, which you've created). 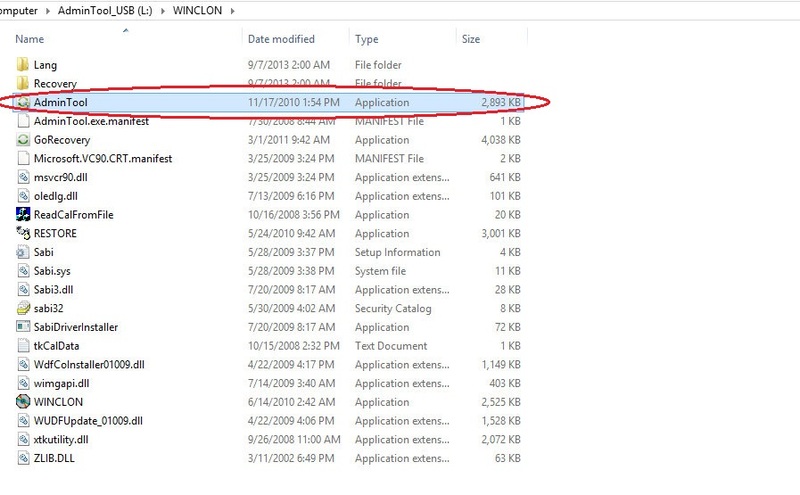 Open 'Winclon' folder. Click on Admin Tool application and run. 21. When the application run click on 'Execute' in Step 1. 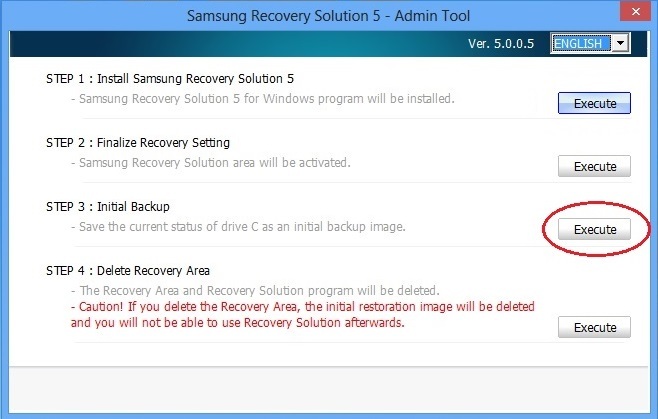 And Install Samsung Recovery Solution Application. 23. All done. 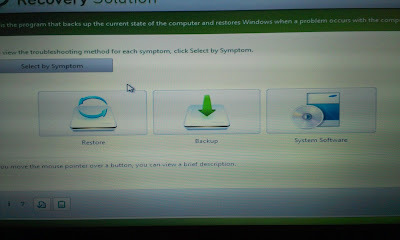 Now you can back up your system. 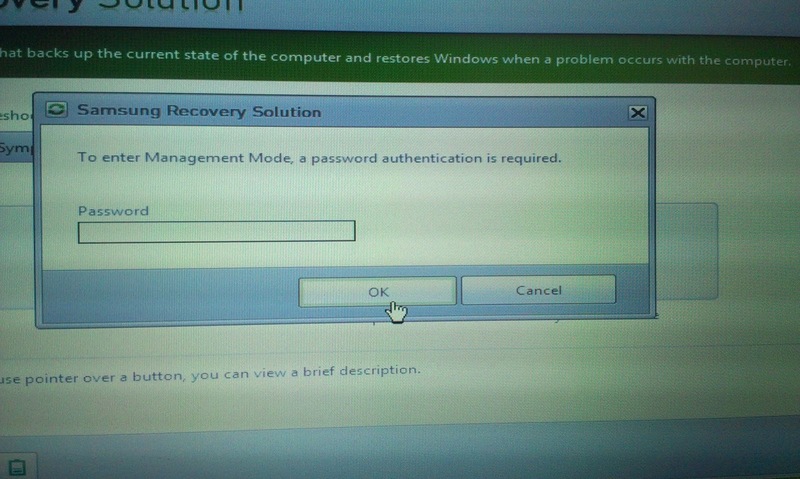 Which can be restored just by pressing F4 while booting. 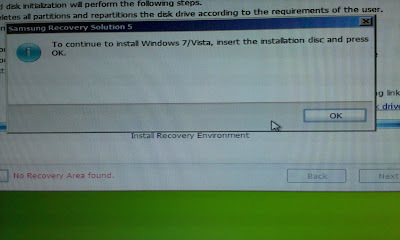 So install whatever you want and back up. 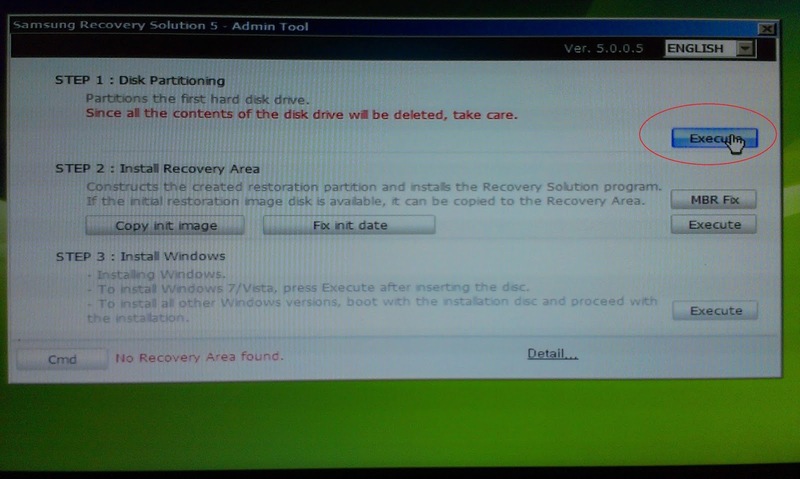 But remember Samsung Recovery Partition is only 20 GB. 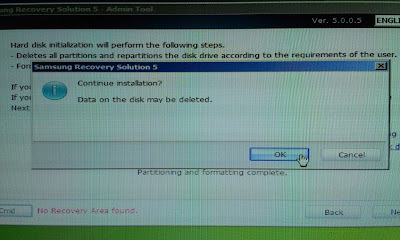 So you can't back up more than 20 GB in the OEM partition. 24. 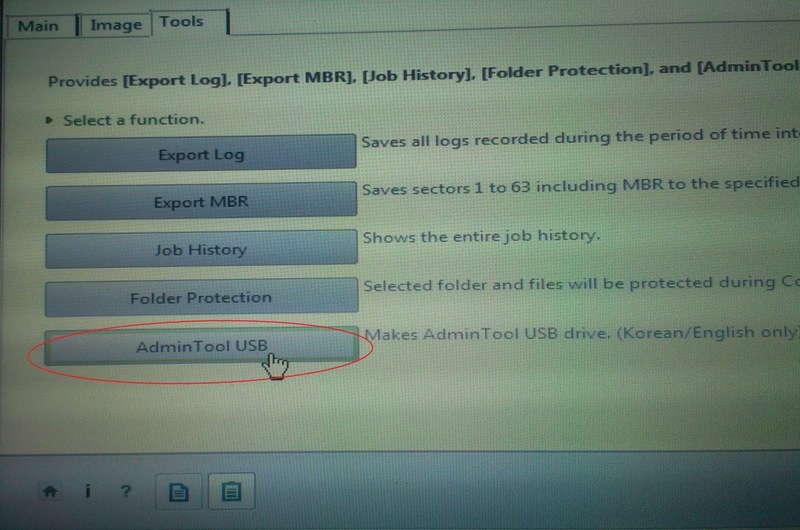 To back up- again run Admin Tool Application from pen drive(as I mentioned in Step 20). Click on 'Execute' in Step 3. Your computer will be rebooted. And back up will start automatically. 25. After completion just restart. 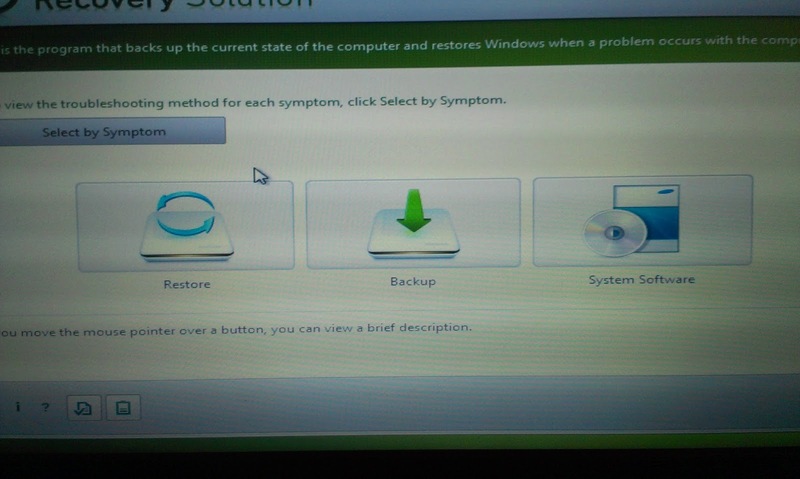 Now you can restore your system by pressing F4 while booting. 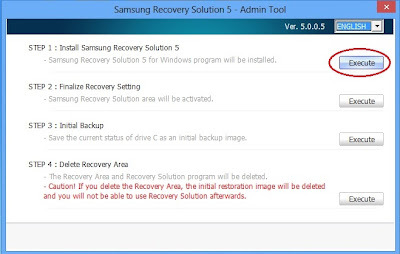 Thank you for reading the article about Create Samsung Recovery Partition on the blog NEW TECH If you want to disseminate this article on please list the link as the source, and if this article was helpful please bookmark this page in your web browser by pressing Ctrl + D on your keyboard keys. At the point when your PC will begin for first time after finishing of Windows establishment Help with Essay run Admin Tool application from pen drive. To do this open your pen drive(Samsung Recovery Solution Admin Tool bootable pen drive, which you've made). 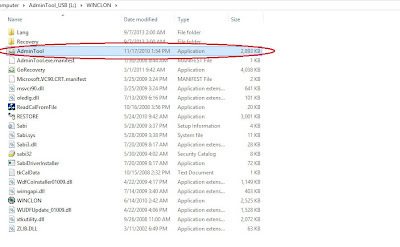 Open 'Winclon' organizer. Tap on Admin Tool application and run. Now, the samsung restoration solution admin tool usb pen force need to be inserted inside the pc (or computing device, as the want arises). -the technique of Samsung restoration answer begins thereafter. -the process of samsung recuperation answer starts off-evolved thereafter | Write my Essay for me. Create Samsung healing partition with hotkey functionality which may be restored later by means of pressing f4 while booting when your pc. 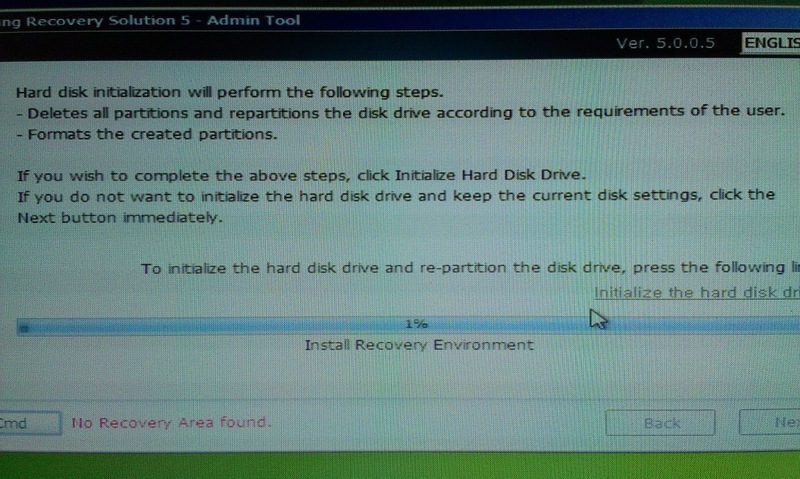 I noticed I have by chance eliminated the recuperation partition once I formatted. ... 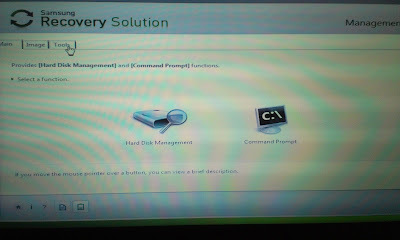 I've tried creating a new partition and shifting the documents to it - Info shared by Who Can Write My Assignment. Teaches you a way to restore deleted photographs in your samsung galaxy by way of restoring them from a samsung cloud or google pictures back up, or by using the 1/3-birthday celebration mobisaver restoration software on a pc. Deleted pix can most effective be restored from samsung cloud or google photos if they have been previously subsidized up | Homework Site. These all steps are really good for us because it is the main issue which is faced by all the users of UK based affordable assignment and want to recover all their data and other things which is important for them and also it is something new for me especially as I can easily create a partition for it now.